Saturn is the sixth planet from the Sun and is the second largest in the solar system with an equatorial diameter of 119,300 kilometers (74,130 miles). Much of what is known about the planet is due to the Voyager explorations in 1980-81. Saturn is visibly flattened at the poles, a result of the very fast rotation of the planet on its axis. Its day is 10 hours, 39 minutes long, and it takes 29.5 Earth years to revolve about the Sun. The atmosphere is primarily composed of hydrogen with small amounts of helium and methane. Saturn is the only planet less dense than water (about 30 percent less). In the unlikely event that a large enough ocean could be found, Saturn would float in it. Saturn's hazy yellow hue is marked by broad atmospheric banding similar to, but fainter than, that found on Jupiter. The wind blows at high speeds on Saturn. Near the equator, it reaches velocities of 500 meters a second (1,100 miles an hour). The wind blows mostly in an easterly direction. The strongest winds are found near the equator and velocity falls off uniformly at higher latitudes. At latitudes greater than 35 degrees, winds alternate east and west as latitude increases. Saturn's ring system makes the planet one of the most beautiful objects in the solar system. The rings are split into a number of different parts, which include the bright A and B rings and a fainter C ring. The ring system has various gaps. The most notable gap is the Cassini [kah-SEE-nee] Division, which separates the A and B rings. Giovanni Cassini discovered this division in 1675. The Encke [EN-kee] Division, which splits the A Ring, is named after Johann Encke, who discovered it in 1837. Space probes have shown that the main rings are really made up of a large number of narrow ringlets. The origin of the rings is obscure. It is thought that the rings may have been formed from larger moons that were shattered by impacts of comets and meteoroids. The ring composition is not known for certain, but the rings do show a significant amount of water. They may be composed of icebergs and/or snowballs from a few centimeters to a few meters in size. Much of the elaborate structure of some of the rings is due to the gravitational effects of nearby satellites. This phenomenon is demonstrated by the relationship between the F-ring and two small moons that shepherd the ring material. Radial, spoke-like features in the broad B-ring were also found by the Voyagers. The features are believed to be composed of fine, dust-size particles. The spokes were observed to form and dissipate in the time-lapse images taken by the Voyagers. While electrostatic charging may create spokes by levitating dust particles above the ring, the exact cause of the formation of the spokes is not well understood. Saturn has 30 named satellites and more continue to be discovered. 60-HST exposures showing a storm in the atmosphere of Saturn. Saturn and its rings completely fill the field of view of Cassini's narrow angle camera in this natural color image. This is the last single 'eyeful' of Saturn and its rings achievable with the narrow angle camera on approach to the planet. 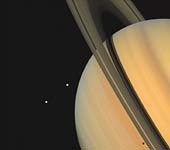 From now until orbit insertion, Saturn and its rings will be larger than the field of view of the narrow angle camera. Color variations between atmospheric bands and features in the southern hemisphere of Saturn, as well as subtle color differences across the planet's middle B ring, are now more distinct than ever. Color variations generally imply different compositions. The nature and causes of any compositional differences in both the atmosphere and the rings are major questions to be investigated by Cassini scientists as the mission progresses. The bright blue sliver of light in the northern hemisphere is sunlight passing through the Cassini Division in Saturn's rings and being scattered by the cloud-free upper atmosphere. In one of nature's most dramatic examples of "now-you see-them, now-you-don't," NASA's Hubble Space Telescope captured Saturn on May 22, 1995, as the planet's magnificent ring system turned edge-on. This ring-plane crossing occurs approximately every 15 years when the Earth passes through Saturn's ring plane. The rings do not disappear completely because the edge of the rings reflects sunlight. The dark band across the middle of Saturn is the shadow of the rings cast on the planet (the Sun is almost 3 degrees above the ring plane.) The bright stripe directly above the ring shadow is caused by sunlight reflected off the rings onto Saturn's atmosphere. Two of Saturn's icy moons are visible as tiny starlike objects in or near the ring plane. This image, taken by the Hubble Space Telescope, shows a rare storm that appears as a white arrowhead-shaped feature near the planet's equator. The storm is generated by an upwelling of warmer air, similar to a terrestrial thunderhead. The east-west extent of this storm is equal to the diameter of the Earth (about 12,700 kilometers or 7,900 miles). The Hubble images are sharp enough to reveal that Saturn's prevailing winds shape a dark "wedge" that eats into the western (left) side of the bright central cloud. The planet's strongest eastward winds, clocked at 1,600 kilometers (1,000 miles) per hour based on Voyager spacecraft images taken in 1980-81, are at the latitude of the wedge. To the north of this arrowhead-shaped feature, the winds decrease so that the storm center is moving eastward relative to the local flow. The clouds expanding north of the storm are swept westward by the winds at higher latitudes. The strong winds near the latitude of the dark wedge blow over the northern part of the storm, creating a secondary disturbance that generates the faint white clouds to the east (right) of the storm center. The storm's white clouds are ammonia ice crystals that form when an upward flow of warmer gases shoves its way through Saturn's frigid cloud tops. 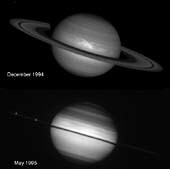 The top image shows the first image ever taken of bright aurorae at Saturn's northern and southern poles, as seen in far ultraviolet light by the Hubble Space Telescope. Hubble resolves a luminous, circular band centered on the north pole, where an enormous auroral curtain rises as far as 2,000 kilometers (1,200 miles) above the cloudtops. This curtain changed rapidly in brightness and extent over the two hour period of HST observations. The aurora is produced as trapped charged particles precipitating from the magnetosphere collide with atmospheric gases. As a result of the bombardment, Saturn's gases glow at far-ultraviolet wavelengths (110-160 nanometers). These wavelengths are absorbed by the Earth's atmosphere, and can only be observed from space-based telescopes. 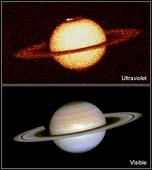 For comparison, the bottom image is a visible-light color composite of Saturn as seen by Hubble on December 1, 1994. Unlike the ultraviolet image, Saturn's familiar atmospheric belts and zones are clearly seen. The lower cloud deck is not visible at UV wavelengths because sunlight is reflected from higher in the atmosphere. Saturn has 31 officially recognized and named satellites. In addition, there are other unconfirmed satellites. One circles in the orbit of Dione, a second is located between the orbits of Tethys and Dione, and a third is located between Dione and Rhea. The unconfirmed satellites were found in Voyager photographs, but were not confirmed by more than one sighting. Recently, the Hubble Space Telescope imaged four objects that might be new moons. 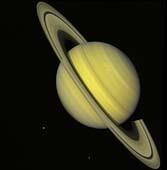 Several generalizations can be made about the satellites of Saturn. Only Titan has an appreciable atmosphere. Most of the satellites have a synchronous rotation. The exceptions are Hyperion, which has a chaotic orbit, and Phoebe. 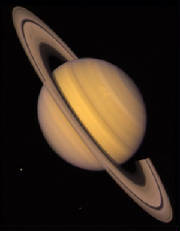 Saturn has a regular system of satellites. That is, the satellites have nearly circular orbits and lie in the equatorial plane. The two exceptions are Iapetus and Phoebe. All of the satellites have a density of < 2 gm/cm3. This indicates they are composed of 30 to 40% rock and 60 to 70% water ice. Most of the satellites reflect 60 to 90% of the light that strikes them. The outer four satellites reflect less than this and Phoebe reflects only 2% of the light that strikes it.